This is one of the most enjoyable two-player experiences I've had in a small game. The game challenges one's spatial recognition as well as the push-your-luck sense of judgment for when to play cards in particular spots in the gallery. The game just works on all levels AND it's pretty to look at. Another winner by Alf Seegert! Musée is a 30-minute card laying game for 2-4 players. In this fast-paced card game, you collect impossibly valuable works of art and put them on display in your own personal art museum, the Musée. The only problem is that your opponents are doing the very same thing! Each gallery must be organized properly by exhibit number, but to succeed you must balance your passion for order with the need for public acclaim. Impress visitors by tastefully positioning works of art side-by-side showing similar themes. Make sure you don’t get too greedy for applause, though — doing so might disorganize your collection and keep you from displaying any more paintings! The first player to complete each separate gallery will open the exhibition early and receive extra recognition. The player who displays the most compelling combination of artworks in the most artistic manner is the winner. Musée includes sixty unique fine art images from artists ranging from the fifteenth to the early twentieth centuries, all licensed through Bridgeman Art Library. 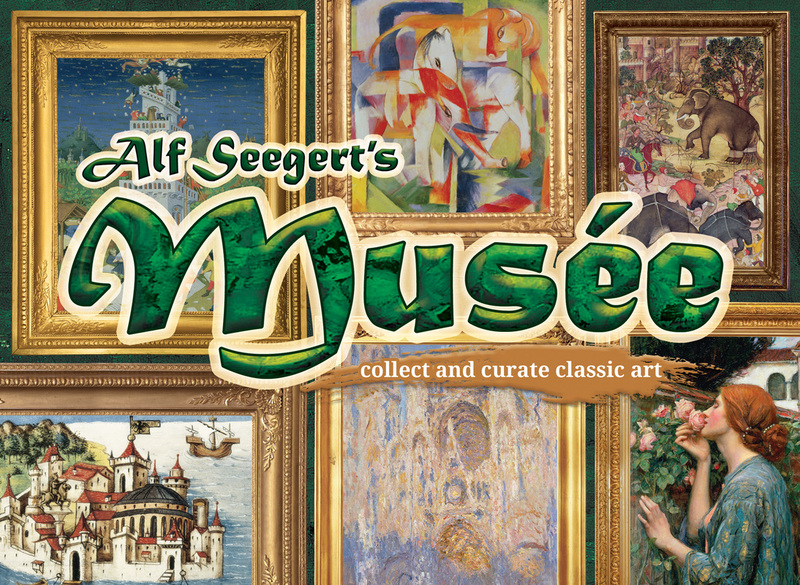 Order Musée online at Eagle and Gryphon Games. Interview with Paco at G*M*S Magazine about Musée. A gallery filled with thank-yous goes out to Natasha Seegert; Rick, Joanne, and Alex Soued; Jacovis; Zach Johnson; Alan Mouritsen; Patrick Whiting; Ian Whiting; Allie Menzdorf; Shane Smith; and Tara Merrill. Special thanks goes to Gryphon Games for developing and publishing yet another one of my games (again doing a beautiful production), to Andrew Long for the striking card design, Pixel Productions for the gorgeous cover design, and Bridgeman Art Library for making such astonishing works of art available for this game. Continued appreciation goes to Sean MacDonald and his game Pastiche for inspiring designers to create more games themed on fine art. If I've left anyone off this list, please accept my apologies, drop me a note, and I'll fix it!